TOP: Twin Lakes Elementary School, a public school operated by Gallup-McKinley County Schools, recently received this graceful new building. BOTTOM: Bahastl’ah’s log-hogan senior citizens center awaits the lunch crowd. 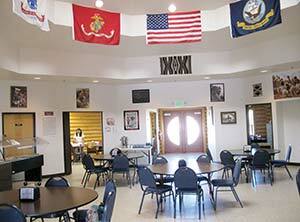 The large and active center attracts seniors from the surrounding communities as well. When Bahastl'ah Chapter, formerly known as Twin Lakes, was chosen as the hub for its region in the Navajo Nation's new decentralization scheme, the people here were not surprised. In fact, they would have been insulted if Bahastl'ah had not been the first choice. Much farther back than anyone can remember, this broad floodplain north of what is now Gallup has been a meeting place. According to the New Mexico Office of Archaeological Studies, people came together here to plant their summer crops and conduct rituals since at least 800 B.C. If you count seasonal settlement, Bahastl'ah is among the oldest continually settled places in the state. And in New Mexico, that's saying something. Since at least the 1800s, said Chapter President Norman John II, Navajo leaders from this south-central region of Dinetah chose Bahastl'ah for their summits as well: the rocky protrusion known as Gossip Hill, with its 360-degree view of any welcome or unwelcome guests, and Ma'iitsobito ("Wolf Springs" ) in the foothills of the Chuskas, where trees downed by seasonal floods made convenient seats. Because it was the central population center for its region, Twin Lakes was the second Navajo chapter established (after Leupp), and long before the first chapter house was built in 1956, leaders would conference here before taking their concerns to Window Rock. It was among the first communities to get a Bureau of Indian Affairs school, back in 1934 (John's mother Clara, now 96, had the job of raising and lowering the flag there). Perhaps because of its long history of meetings, Bahastl'ah has produced some excellent leaders over the years. Tom Lee, the first Native American to win a seat in the New Mexico State Senate, hailed from here -- in fact, he was the father of the current chapter vice president, Randolph Lee. Randolph Lee recalled when his father was first approached by the Democratic Party to run for office in 1966. They didn't have a candidate in his district and thought he had a good chance. The chapter's first president, a prominent businessman and a survivor of the Bataan Death March, Tom Lee was a little insulted the Democrats wanted him just because they couldn't find anyone else, his son recalled. He decided to run on the Republican ticket. Name -- Originally Twin Lakes for two small lakes on either side of '491 (they have since dried up), the chapter changed its name to Bahastl'ah in 2009. The name means something like "Canyon Cove" in Navajo, but, according to Chapter President Norman John, who heard it from his 96-year-old mother, the chapter was named not for a land form but for a person. "There was a very short little man, maybe five-foot-one or five-foot-two. He was all bent over," John said. "He would come to every ceremony. He was sort of a mountain man. Everybody just called him 'Bahastl'ah.'" Population -- 2,212 at the last Census; the chapter officials estimate it at between 3,000 and 3,500. It is one of the more densely population small chapters on the reservation. Claim to fame -- Parts of the 1965 Western "Hallelujah Trail" were filmed here. John said that before his term is over, he would like the chapter to change the name of Johnson Road to "Hallelujah Trail." Upcoming events -- The 6th Annual Twin Lakes Gourd Dance, Poker Run and Veterans' Princess pageant is scheduled for Saturday, Sept. 13. Call 505-728-5599 for more information. Lee not only survived the primary but ended up serving three consecutive terms starting in 1967. Afterward, he served several terms on the Navajo Nation Council. John said the elder Lee seldom experienced racism in the senate because he just plain won everybody over. "He was a father figure to everyone," John recalled. "He never had a closed door." John and the younger Lee try to follow in his footsteps. "We try not to say no if we can help it," said Randolph Lee. "We say, 'How can we make this a win-win?'" Everett Jole, who supervises the attractive log-hogan senior center next door to the chapter house, confirmed that. "If I need something for my seniors," he said, "I don't have to ask twice." Although the senior center serves a steady flow of clients -- including, Jole says, six in their 90s -- this is a young chapter. John estimates 60 percent of the population is under 30, many of them young professionals who moved back home after finding jobs in Gallup or Window Rock. "We really do try to focus on our youth," said Accounts Maintenance Specialist Louise Gleason. "We want them to have everything state-of-the-art." Community Services Coordinator Ronda Leonard pointed out the newer-model computers in the beautiful three-year-old chapter house, where students can take online classes and exams. John said the chapter is generous with its scholarship fund, sometimes even assisting youth from outside the chapter, and hires as many summer youth as it can afford -- 98 this year. "We have seven Ph.Ds from this chapter, three M.Ds, one veterinarian, one attorney and a lot of engineers," he boasted. "We're very proud of our young people and we want them to be happy here." For such an old chapter, Twin Lakes has a lot of nice new architecture. The graceful arches of the present elementary school, built in 2003, nicely complement the clean, square lines of the new chapter house and the homey look of the senior center. But the chapter isn't stopping there. It has instituted a beautification project, with low cinder-block walls and xeriscaping. The chapter house is done already and the senior center is next. Jole is selling bricks inscribed with the donor's name to help raise funds for the project. The old chapter house, on the other side of U.S. Highway 491, is slated either for demolition or to be refurbished into offices the chapter hopes to rent to the tribal offices displaced by the closure of Administration Buildings 1 and 2 due to mold. A veterans' memorial and a picnic park for families are also on the drawing board, along with a planned community development in partnership with the Navajo Housing Authority. 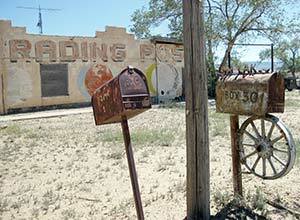 Tom Lee's picturesque old trading post is still there, though it's been defunct for decades. Leonard envisions a nice family business like a mom-and-pop ice cream shop going in there. A convenience store with gas pumps would also be nice, said John, although it may face too much competition from those just a few miles north on '491. In short, this ancient meeting spot hopes to continue that legacy but in a brand new way.